The Abe Administration has announced plans for compulsory ‘chonmages’ for all males aged 18 and over in its election manifesto for the House of Councillors election in the summer. Prime Minister Shinzo Abe attended today’s press conference with his own newly fashioned chonmage. 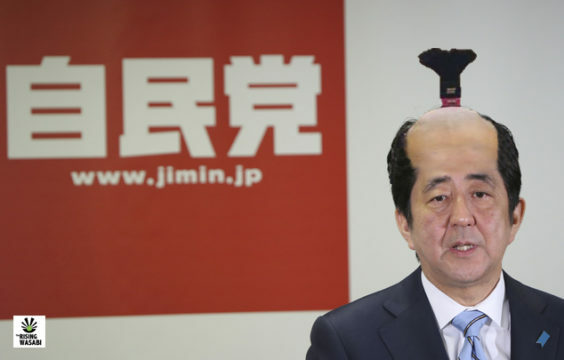 The LDP has long advocated the need to amend the post-war constitution drafted by the Allied Forces and believes the ‘chonmage’ can help restore the strength of the nation. PM Abe said restoring the chonmage will help instill traditional values and once again make Japan a truly sovereign state. “We will raise the issue as our campaign pledge – it’s time to wind back the clock,” said Abe. The specifics of chonmage obligations, including minimum chonmage height requirements, will be decided “in due course” with the barest amount of public discussion.